Under the direction of James Ramer, the studio-based Parsons MFA Photography program brings visionary students together with some of the artworld’s most influential photographers. Students are encouraged to develop their individual vision in a collaborative, interdisciplinary environment and to explore related technologies, focusing on the relationship between concept and production. 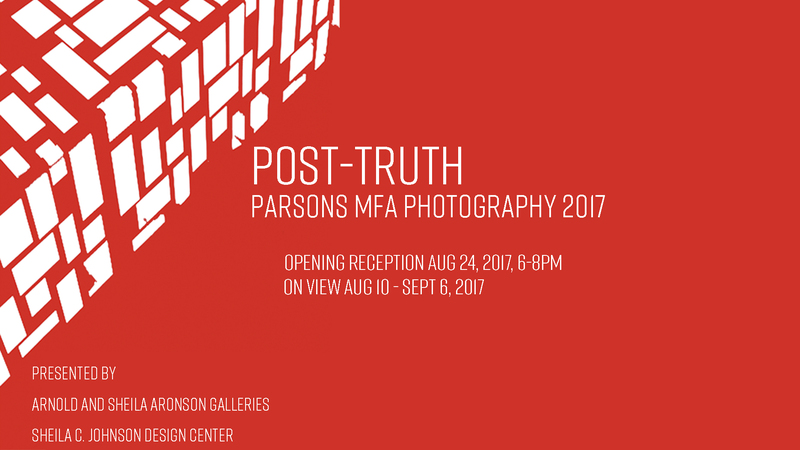 For more information about the thesis exhibition, please visit post-truth-2017.com. You may also find the opening’s Facebook Event online. Gallery hours: Open Monday – Saturday, 12:00 noon – 6:00 p.m. and late Thursday evenings until 8:00 p.m.
Closed Sundays in August, and all major holidays and holiday eves (including Labor Day).